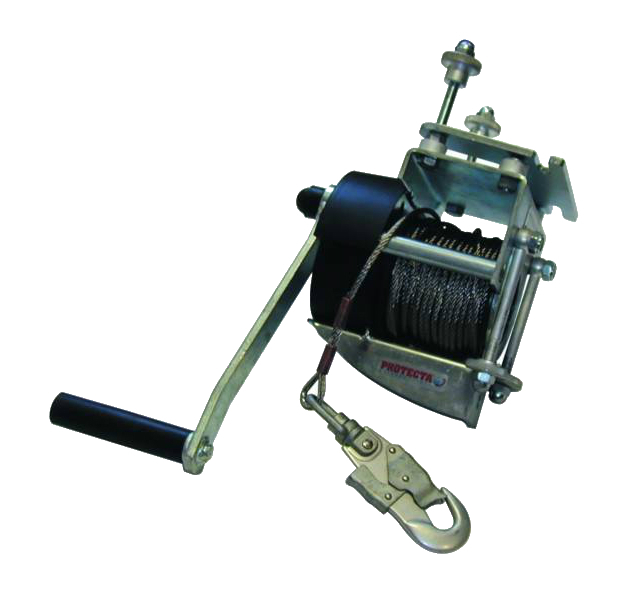 Confined space winch with 20 m 5mm stainless steel cable lifeline. Winch for descents or rescue, Quick mount bracket for PRO™ tripod. Built-in manual safety lock, Disc brake system. Best used in combination with suspension harness, to be used in combination with tripod. Corrosion resistant construction and Galvanised cable. Confined Space Winch AT200 conforms to CE EN 1496 cl B safety standard. Allows operator to lock-out the device for work positioning requirements and for added safety. Four disc brakes provide added security and prevent the load from unintentional movements. Zinc plated steel construction is very durable, standing up to the elements for extended longevity. Personal fall protection equipment. Rescue lifting devices. Rescue lifting devices used as components of rescue systems. They may be combined with other components for rescue.